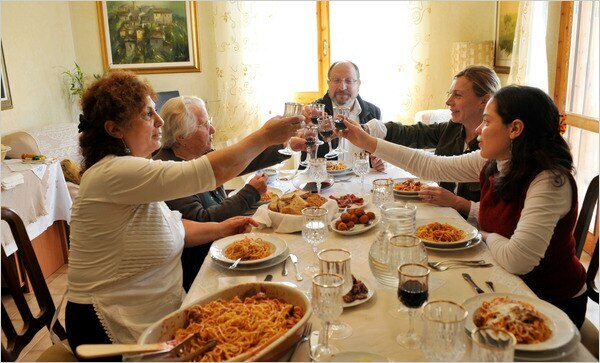 “This may sound impossible, but it’s made vastly easier by Home Food, an Italian organization dedicated to, as its promotional literature states, “the protection and increase of the value of typical Italian gastronomic and culinary legacy.” That is, it’s all about preserving and showcasing the cooking of individual Italian families. From Piedmont in the north to Sicily in the south, from cities like Florence and Milan to hamlets like Abbateggio, Home Food seeks out exceptional home chefs, puts them through a training course and dubs them Cesarinas — little Caesars, emperors of the kitchen. Then, a few times a month, the Cesarinas host dinner parties at which they open their homes to strangers.